This tent will allow you have a party rain or shine. The tent is made with a tough 16 oz block out vinyl top that is cinched for quick installation. 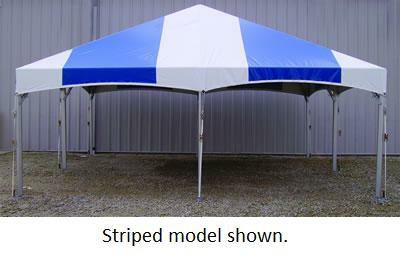 It provides a clean, tight appearance and uses less hardware than the traditional tent frame. The bonded top panels have 1" heat-sealed overlapped seams with 95% of the tent top being bonded with heat-sealed construction. It features a durable aluminum pole kit and a polyester side curtain rope is securely held in with 1" polyester. It has reinforcement patches at the crowns.